There is an ongoing security alert in Londonderry less than 48 hours after an explosion in the city centre on Saturday night. The alert on Circular Road in the Creggan area follows a report of a vehicle being hijacked by three masked men shortly before 11:30 GMT on Monday. Police said the men reportedly “threw an object in the back of it” before abandoning the vehicle. A number of cordons have been put in place and houses have been evacuated. A community centre in Central Drive has been made available to people who have been affected. It follows continued disruption around the scene of Saturday’s bomb outside Bishop Street Courthouse. 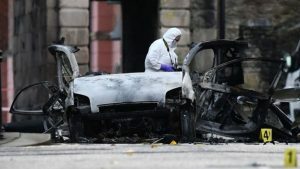 The PSNI said the attack may have been carried out by the New IRA, a dissident republican group. On Monday, police arrested a fifth man in connection with the bombing. Police said a pizza delivery man had a gun held to his head as his vehicle was hijacked and then used in the bombing. One CCTV clip posted on Twitter by police showed a group of young people walking past the vehicle shortly before the blast. At the courthouse, scheduled jury trials have been put off until Tuesday. Cases listed to be heard in the magistrate’s courts are being held in Strabane, with some other hearings switching to Coleraine. A police cordon has now been reduced but Bishop Street car park still remains closed. 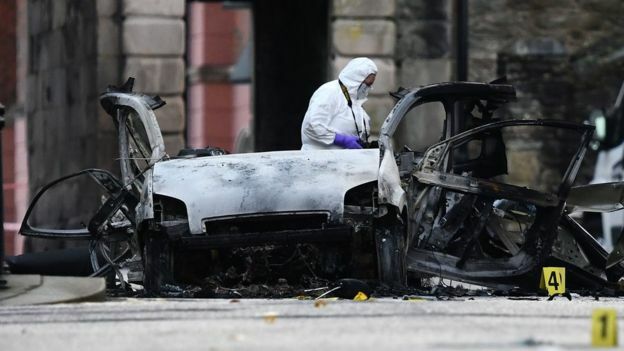 PSNI Supt Gordon McCalmont told BBC Radio Foyle that the police were trying to get the city back to normal and show the attack had “little or no long-term impact”. He said the PSNI it was “lucky we are not talking about loss of life”. Londonderry’s city centre manager Jim Roddy told BBC Radio Foyle he was out walking when he got a call to say a car had been abandoned on Bishop Street. “We could be looking at many deaths today,” Mr Roddy said.